I long held back from making a maxi dress because I was afraid of looking completely swamped in one. But when my eye kept being caught by maxis while browsing pattern catalogues at Tissus Reine with my good friend Julie last June, I remembered Trena sported a maxi dress with success almost a year ago (Trena and I are about the same non-height). And I decided to give it a try. I settled on Simplicity 3803 because I liked the shaped midriff (it isn’t a mere rectangle as in so many dress-with-midriff-band patterns). This is a neat pattern, which provides you with a nicely finished inside, too (the bodice is fully lined). I’m a bit disappointed you cannot see the lines better. 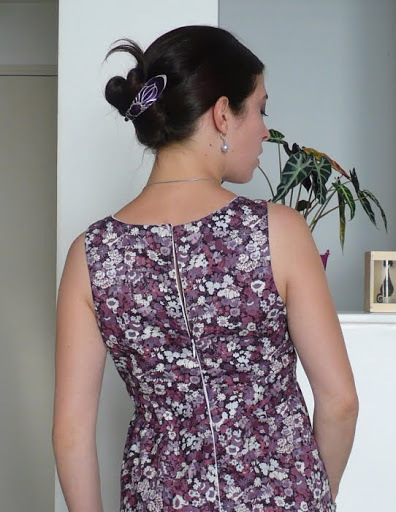 You really can see the bodice shaping IRL, but the small floral print here gave the camera a hard time, I’m afraid. This is another Liberty piece I bought at Shaukat on Old Brompton Road when I last was in London. I wanted to add a ruffle at the bottom, as in view C, but I didn’t have quite enough fabric – and I was determined to use this Liberty print. Another reason I chose this pattern over others maxi dress patterns is that I found the keyhole opening in the back really classy. I loved Pirouette’s version of this, and I’m a little disappointed mine doesn’t show that well in the picture. Probably because I have a small back and I should have fitted the bodice back even more than I usually do? (I always go down two sizes in the back). Oh, and I promise you the upper edges are actually even. Must have been the way I was standing in the picture. I made this dress for a picnic I had with friends at the Buttes Chaumont late last June (just a couple of weeks before I left Paris). I figured a very long dress would be both pretty AND practical to sit down in the grass – and it was. Besides, the Liberty lawn gives the dress a fresh feel against the skin. It’s been 30-32°C here this week (mid to high 80s Fahrenheit), so you bet I’m still wearing summer dresses! J'aime beaucoup le liberty que tu as choisi! I have the same problem with my height and the maxi dresses. I would love to have one for the cruise, I can just see myself walking around the ship in one. Unfortunately, they really don't make them in petite! You definitely chose a good pattern, scaled to your height. It looks lovely and summery, I especially like the picnic picture. And I always love a Liberty print! Very pretty maxi. I made the short version and like you I love the keyhole in the back. Très jolie robe. Tu vas en profiter encore longtemps ici! Hey, there, Isabelle! Your dress looks great! This pattern is a favorite of mine. What a wonderful dress you've made! Love it on you! A lovely dress Isabelle. Isn't it great to have the right weather as well to wear it. That is a lovely dress. But, you would look absolutely beautiful in a sack! What a great dress. I love maxi's! Of course the sleeveless thing does me in, so I don't make them for myself. My 11 year-old niece is begging me to make her one. Actually worked a bit on a new doll dress today. A challenging, heavily draped and pleated design from the 1870's. Hope to post some photos soon. Lovely! A perfect combination of fabric, pattern and fit. Well done. Isabelle, your maxi dress is lovely! I feel so comfortable in a full length dress like this in our hot summers, as the fabric swirls around my legs creating a gentle draft which is cooling. I think this length suits all heights. I'm only 5'2″ and I feel dowdy in a skirt that is below my knees but not floor length. It looks lovely! You've finally persuaded me to try a maxi too. Very well done! I think the fact that you used a smaller scale print really made this dress work for you and your height. You look cool and comfortable and pretty. Isabelle…how lovely you look in your maxi-dress! Being petite brings on some challenges (I am barely 5' tall), but you have a wonderful eye for proportion. The dress looks lovely on you! Very pretty. The navy floral dress is really cute too. I like the contrast on the neck. It does add that something extra. I love your version. It is actually my favorite that I have seen. The fabric is perfect! Very well done for a petit–you look fabulous! So pretty! And I had never noticed that keyhole opening in that pattern before. I'm going to have to give it a second look! Glad to see all the things you've been making lately. The maxi dress is very pretty, and I especially like the blue dress from your last post. I wish I could stop working such long hours and get some sewing done. This is ridiculously cute on you! I love the fabric, the shape, the length–it's just darling. Hope the beginning of the school year is treating you well.